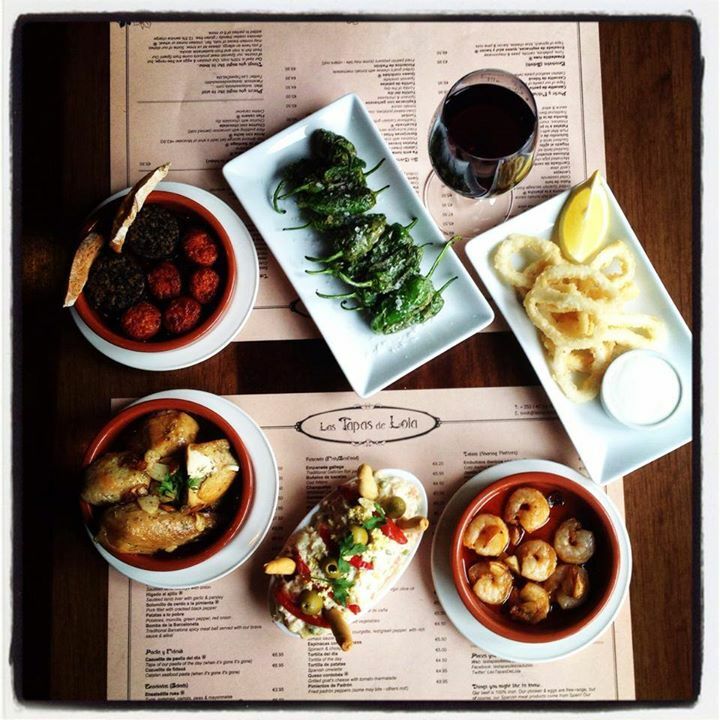 A small gem in the heart of one of Dublin’s busiest streets, this co-owned Irish and Spanish tapas restaurant ticks all the boxes. The food is plentiful but of excellent quality, and for a location in the centre of one of Europe’s most expensive cities, is not nearly as pricey as one would think. It was on my way to work on Wexford Street that I first stumbled across the charming Spanish enclave. The area of Wexford street and further up the road, Camden Street, is already a haven for the foodies of Ireland’s capital, as one can find burrito bars and Persian falafel stops slotted amongst Japanese sushi houses and, of course the traditional Irish pub. Nevertheless, the Spanish tapas restaurant immediately caught my attention as I passed by. The authentic feel of the place is cemented by the tiled restaurant sign, and a pretty wall mural which features a scene of a Spanish balcony and flowers. The outside eating area also goes somewhat in aiding the illusion that you’re in Majorca, especially as its equipped against the Irish weather with a cover and outdoor heaters. So even on a cold and rainy day (which, incidentally was the kind of day I decided to eat there) its nice to sit outside. The outside space is limited however, and the restaurant becomes extremely busy on Fridays and weekends. It is therefore advisable to book ahead. However as the old impression goes, a restaurant that becomes so busy must serve good food. After the dining experience my friends and I were given one Sunday evening, I can certainly vouch that for Las Tapas de Lola, this is certainly true. The restaurant offers 4 set group menus, each featuring a selection of tapas, priced from 25-40 euros per person. However, we decided to order dishes straight from the normal tapas menu and our bill per person (divided between 4) did not cost this much. Including a bottle of red wine, we each paid around 19.99 euros each. Therefore, ordering from the tapas menu gives you the better deal, especially as one has free reign over what dishes they can choose! As is typical with tapas, the server recommended around 3 dishes per person. This is what we did as, altogether, our group of 4 mixed and matched around 12 different dishes from the menu. The dishes were a good size for tapas, and 3 to 4 certainly provided one with a filling and satisfying meal. At the end we even considered whether we had ordered too much food! In addition to the size, the quality and taste of the food was second to none. For a restaurant with food and an experience that is so delicious and authentic, I believe the tapas menu is extremely good value for money. Dublin is one of the most expensive cities in Europe, and the average cost for an “inexpensive” restaurant is between 10 and 20 euros, 15 on average. The description of “inexpensive” conjures up more of an image of a late night takeaway, rather than a rustic tapas joint. Therefore, while 19.99 is perhaps slightly more than what I would normally pay for a meal, the amount of food, coupled with the quality and the fact that this figure included alcohol means that I do not think price is a barrier to enjoying food here. This is especially as with slightly less food and no alcohol, the bill would have been even cheaper. Upon sitting down one is also presented with a complimentary aperitif, a small drink which on the day we visited, was a lemon based liquor.